Coffee and Wine. Let’s discuss. Coffee first. Studies show that coffee is good for you (like all things, in moderation), and generally 1-2 cups of coffee a day is nothing to cut out if you feel your best. Remember that I was a decaf drinker for years? That’s because I am very sensitive to caffeine. I’ve become dependent on coffee at different points in my life, and I found that out because I skipped a day and got a raging headache. I usually just have one, maybe two, mugs in the morning, but doing something every single day is enough to get the body too used to having it. I didn’t like feeling like I had to have coffee to avoid feeling bad, so I switched to decaf for a long time. And then I met Thomas, who LOOOOVES coffee. He buys really delicious, locally roasted, freshly ground coffee that smells so amazing, and I just had to hop back on the coffee train. His excitement got me excited about it! I really didn’t notice much difference after adding the caffeine back, but many months later, I started to feel kind of bad in the mornings. It was sort of like being mildly hungover and a bit foggy (and this included mornings when I had no alcohol the night before). I never felt any kind of immediate change upon my first few sips of coffee, but I felt better by mid morning once I had “woken up” a bit. So maybe it was my body asking for coffee first thing, getting it, and then feeling good again. I didn’t like that feeling, so I’ve started to wean myself off of caffeine yet again to see if that is the culprit. I do plan on drinking regular coffee on occasion because I love the taste, but I’m hoping not to get quite so dependent on it in the future (which is hard!). I started the weaning process by having just a half mug for a week, and then less and less until I switched back to decaf. So far, so good! I *think* I am feeling better, but since feelings are so vague it’s hard to be sure quite yet. And now on to wine – yum! The past two years or so I’ve been drinking more frequently than ever. I drink for all of the reasons one would think to partake: because it makes me feel grown-up, because it’s nice to end a long day with a glass of wine, because I have lots of fun social events at bars and restaurants, because it’s relaxing, because it tastes good, and because it makes food taste better. All understandable reasons, right? And then I listened to this three-part podcast series by Brooke Castillo. (You can listen on her podcast through iTunes or watch the videos that I linked to on her website.) I was in agreement with every single point she makes about all the reasons people get conditioned to drink alcohol habitually (which is different from alcoholism). So much of what Brooke says about the classical conditioning that goes into having a drink to celebrate, relax, or socialize and then wanting to satisfy that desire again had me nodding my head in agreement. I am practicing some of her techniques (such as having the desire and not acting on it) and I think it is working to break the chain. I just want to drink less, not quit altogether, and her techniques work for either. And I always have lots of mocktail ideas! Like the coffee, so far, so good on progress. I’ll update you guys in a few weeks! I’ll be sure to update you guys soon enough on both of these. What are y’alls thoughts on this topic? 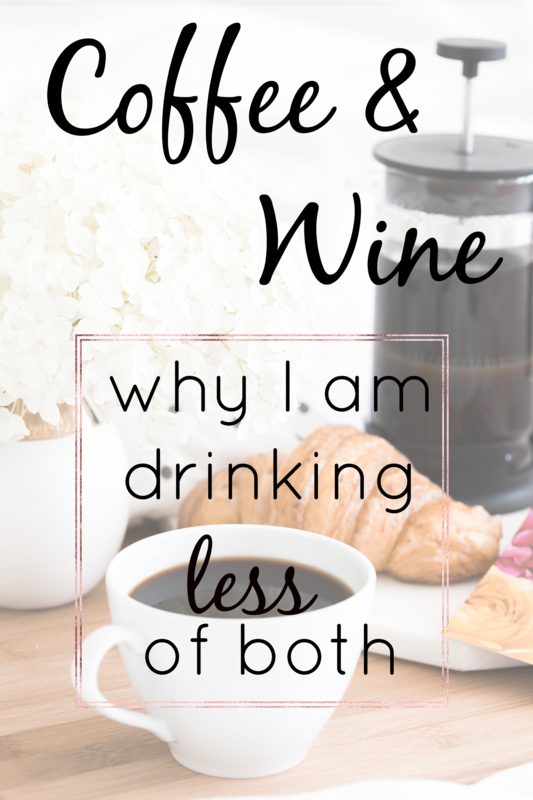 Do you drink coffee or wine? Why or why not? I personally don’t drink coffee or any type of alcohol. I love coffee-flavoured snacks (it’s my favourite ice cream flavour too) but I prefer tea over it when it comes to getting my caffeine in. And I’ve just never liked the taste of alcohol! I drink both, but I hardly ever drink alcohol during the week, so its not a habit for me. I just drink on the weekends when im usually dining out or doing things with friends.. coffee everyday for me, but onpy one small thermus full! I have never liked alcohol, never even been close to drunk and am now in my late twenties! However,it’s beginning to grow a little bit on me – mostly cocktails that are not very strong. 9/10 though the taste of alcohol is just gross to me. I’ve always felt like an outsider with alcohol because I drink it so rarely. But it’s a fascinating topic to me exactly because I’m outside of the experience; the huge array of ways people use and enjoy alcohol is sooo interesting to me. I have noticed over-drinking has become quite normalised (according to unit guidelines, sizes of glasses etc.) It’s a bit like how portion sizes have become bigger and bigger and now people’s perception of a portion of food is skewed, so have people’s perception of ‘normal’ drinking. You seem to have a very good relationship with it though! As for coffee – I go through phases of feeling like I need it more. I love the taste but should definitely move over to more decaf – I find anything beyond lunch time eats into my ability to sleep. you are absolutely right on the portion sizes of alcohol and the availability these days from the huge craft beer and cocktail industries. There is just so much selection. And I’m the same way with caffeine – after 11am or so and I can’t fall asleep. well…I’m on my 2nd cup of coffee this morning and screaming in my head “noooooooooooo…..you can’t take away my coffee!” Though, honestly, it’s more habit/routine than taste. I do not have issues with wine or other alcohol. It’s just never been a desire other than the occasional social drinking. I drink coffee every day because I love the taste (and the ritual of a warm beverage). I usually have two cups and then just have that “I’m done” feeling. Do you find decaf tastes good? I wouldn’t mind trying a half and half mixture. I’ve only bought decaf once and it didn’t taste very good, so I never tried it again. For the last year or so, I find myself hardly ever drinking any type of alcohol. I just kind of stopped buying it for home consumption without really realizing it. I still drink alcohol when I am out with friends or out to dinner with my husband but that’s about it. Like you mention, mocktails are a great option. It made me realize I was really just wanting a “special drink'” at the end of the day or while making dinner. Now, I usually have kombucha, water kefir or some sort of sparkling water. I look forward to “cocktail hour” just the same as I did when I was drinking a beer or wine, so I think it was a ritual thing for me again. Totally agree with you on all the rituals! I don’t think anything compares to a freshly brewed, locally roasted, regular coffee, but I find the decafs to be about 85-90% as good and that’s good enough for me! What have you found to be your favorite local (Charlottesville) decaf coffees? I, too, love the taste of a mug of coffee to warm my body and soul in the mornings, but find I’m quite sensitive to the caffeine. Great article, by the way! I’m looking forward to reading your follow-up! The Shenandoah Joe Mexican Organic Decaf is awesome! I LOVE coffee (from small coffee shops) but I gave it up a couple years ago after I was having some hormonal issues. I’ve read that it can disrupt hormones. Sometimes on vacation I’ll have a cup but it really makes me jittery which I can’t stand so I’ll get half caf or decaf. As for wine (or any alcohol) I’ve always limited myself to weekends only (Friday-Sunday) unless it’s someone’s birthday or there is a celebration. My husband is definitely a habitual drinker, like you mentioned. He’s not an alcoholic but he subscribes to the one a day. We’ve had many conversations about it and I’ve asked him to cut down sometimes and he will but that podcast sounds interesting. The recommendation is one for women and two for men, so I can see why he would want to stick to his one a day with no problem, especially if he feels great. I think it’s extra hard when the partner is the one who wants to cut back. Fresh out of university, I was not a coffee drinker at all. I was also very sensible to caffeine and felt my hands shaking and just overall overstimulated with everything around me. So, I was drinking hot water, or tea, or decaf. Enter, the new job with the free coffee. It starts with a cup every now and then, and now, 10 years later, I need my cup of coffee in the morning or I stay in this foggy state until 10am. Not a very good feeling. On weekends, I used to be able to go without, but now, I crave it and feel restless until I have my first sip. Pretty amazing how the body adapts! This is refreshing. I feel like our culture is very into wine and beer. I often hear a glass of wine as a solution for any parenting issue. I feel like I am the only one who wants to keep wine drinking in moderation. I like the Nespresso decaf too – especially the espresso pods! I loved this post! I struggle with the same thing. I wake up early to go to the gym during the week (around 5:15), and even though I get to bed around 9:30 I feel like I need coffee to function – which slips into “needing” coffee on the weekends too. My boyfriend has the same schedule, but with no coffee. I figure if he can do it, I can do it! Good luck to us both! Oh God. I used to be so good about having just one cup of coffee, but now I’m a full-time grad student and it’s so hard to focus for so long without coffee. It’s honestly more about rewarding myself for sitting there so long (with lots of walk breaks of course!). Half and half blends work for me, but I can actually tell the difference. You might have a legit allergy to coffee if you wake up feeling hungover! I read about this thinking I might have a similar sensitivity. It zaps your energy more than it helps! Alcohol is fun, but I find I don’t sleep well when I drink it at dinner so I try to keep it to a minimum during the week so I can survive class. Has it ever affected your sleep patterns? I feel gross and hungover-y very quickly. Not ideal for trying to get comfy!! I don’t drink at all. I have had a lot of issues with alcohol in the past, and since everyone in my family has struggled with alcoholism or some sort of addiction issues, its best for me to steer clear. ESPECIALLY now that my kids are getting older. (almost 5 and almost 3) A lot of alcoholism is genetic and I made the choice to keep it out of their lives as much as possible. My husband and his dad will occasionally have a beer and my husband loves to indulge in a good whiskey once in a while. Besides the fact that alcohol doesn’t make me feel good. I am a lightweight. Wine gives me headaches. Beer hurts my stomach. And while I do love a good vodka, its not worth the gross feeling the next morning (Especially when I am an early bird and a SAHM to two very active kids.). I had to give up coffee a while back because it really started to bother my stomach. Now I’ll drink a cup maybe a handful of times a year (I love a cup when I go out for brunch!). BUT…I do drink a big French press pot of green tea every morning and I’m thoroughly hooked on the caffeine in it. I feel that sluggish grogginess that you described until I’m a cup or so in. But I feel like green tea is pretty healthy, and I just love starting my day with a hot mug. I have no intention of giving it up! I quit caffeine when I was pregnant and truthfully, I missed it way more than wine OR sushi! 🙂 With alcohol, I tend to go in waves…one week I might have a glass of something a couple of nights, and the next week I’ll have nothing. I’m super conscience of the calories in alcohol (I like to be able to chew my calories — I avoid caloric beverages as much as possible) so I really try to keep alcohol consumption at bay primarily for that reason. That said, I almost never pass up having a drink when I’m with friends and everyone else is enjoying a cocktail. Thanks for this post Kath! I have successfully switched from coffee to tea with the occasional decaf, but I struggle a little bit with cutting out the wine/beer ?. It’s a social thing for me and my husband likes a nightly beer or two so I give in often because he is having one. I’ve tried to at least keep to not drinking two nights in a row (harder on the weekends with social events) but I really want to cut back since an alcohol habit really isn’t aligned with my health and wellness goals. I don’t feel at all addicted, but you’re right, it’s a ritual thing! I find kombucha and sparkling water help and I’ll try Brooke’s technique (love her!). Thanks for starting such a great conversation! Love this post! My husband and I never drank coffee until about 4 years ago. And we started mainly because we wanted to add that ritual into our morning routine, and so many people drink coffee – we thought we were missing out! Now 4 years later, we do drink coffee every morning (and the organic, freshly ground beans – yum!) I love the ritual of having a warm cup each morning, and I enjoy just sipping on it throughout the morning. I am like you though, in that I think I am extremely sensitive to caffeine. So we have to be really careful with how strongly we brew it now. I actually don’t really drink at all anymore. I hated the hungover feeling I would get the next morning (which for me was more nausea than a headache) and found it just wasn’t worth it anymore. I do feel like an outsider at certain social events, which I don’t like. I just wish alcohol didn’t have to be such a large part of socializing. I spent 20 years in the Navy and never drank coffee until after I retired. That was 10 years ago. I have now decided to only drink it when I go out and get it. I used to make it at home. On my off days if I can ride my bike to the coffee shop then I’ll go ahead and get a cup. As for the wine, I have lots of conversations with my older friends about have a martini or a mixed drink or even wine when they get home or after diner. It makes me wonder if that was something that was passed down from our parents and grandparents. Wives always had that glass made when the husband came home. Why did that tradition start? I feel now as if I need to have a martini every night. I’ve been trying to drink wine now. Mainly because I feel as though I have been missing out on food wine pairing. Will I have a glass every night? Probably not. But here’s to the experience. I’ve never been a wine drinker and I try not to have coffee as much as I can–I’ve switched to tea! I bought some of the Shenandoah Joe Mexican Decaf and it’s sooo good btw. Alcohol tends to make me feel sick even after just a glass or two so I normally avoid it unless I’m out with my husband and just have a little of his. So interesting! I’m like Thomas and am super into coffee- I buy organic, locally roasted whole bean coffee, grind it myself, and use all kinds of fun coffee apparatuses to brew it (BonaVita, Chemex, AeroPress, etc.) Luckily, I really only like to have 1 cup. I take my time and really enjoy it, too. Like mindful coffee drinking. I drink decaf coffee as well! I’m just way too sensitive to caffeine – it keeps me up at night and make me jittery. Ugh. Luckily, I’ve never had cravings for alcohol. I’ll have a drink in a social setting, but I never think about it otherwise. I also cut back on coffee while I was pregnant – one cup a week, my Friday treat. Now that I have a baby, I’m back to feeling like I can’t live with out coffee, and have 1 cup a day. I notice, without my coffee i’m pretty grouchy…but i’m not ready to try to give it up yet…. I’ve tried quitting coffee a few years ago, and oddly enough it caused my anxiety to be worse! Now I just drink 1-3 mugs every morning before 8am, and no caffeine of any sort the rest of the day. For the past 7+ years, I’ve been a wine aficionado. I genuinely love the taste of wine and all of my friends and family knew it. I never enjoyed being drunk or hungover, so I typically stuck with no more than 3 glasses in the course of an evening. This year, I’ve drastically cut out any alcohol and what I find upsetting is that people assume that I’m either pregnant or trying to get pregnant. It’s like they don’t want to hear that I’m trying to make healthier decisions and that I feel better not drinking (said to them without being all high and mighty) but that being pregnant is a better excuse for not drinking (?). I generally have my 16 oz. thermos of coffee Monday – Friday, but I don’t always finish it. In college, I definitely turned to coffee in the afternoon/nights of studying. After graduation I noticed sometimes in the afternoon I would crave a cup, but usually it was just for something warm. So I started drinking herbal (read decaf) tea to satisfy the craving. On the weekends, I usually have a cup, but some slow mornings, I don’t even miss it, so I feel like I’m not dependent on it. As far as alcohol, I don’t generally drink during the week. I do usually a beer or two on the weekends, but I do notice that it impacts my sleep. Timely post, as I’ve been weighing the consequences of both these things for myself. Like you I started to fall into the habit of having a glass or two of wine most nights. It started to be a “why not?” kind of a thing. Bad day at work, good day at work, wine Wednesday, I vacuumed the house, etc. I can achieve better balance for myself if I have designated drinking days, like someone else mentioned. For me, I try to stick to Friday and Saturday nights, since they’re my most social. Coffee and I have a complicated history. There have been times that’s it’s made me feel awful, and I’ve gone without it for long stretches, only to find myself drawn back to its amazing smell. Nothing quite better than the smell of brewing coffee! Ultimately I do think it disrupts my hormones, or perhaps as a very active person it’s just too much stimulation for my adrenals. I start to feel perpetually bloated and I do notice that it also causes some blood sugar crashes. Black tea doesn’t have the same effect on me. I can replace my coffee with black tea and not have the same issues. Maybe the tea is just a slower caffeine response than the coffee, I don’t know. “Bad day at work, good day at work, wine Wednesday, I vacuumed the house, etc.” <--- haha yup! Good job vacuuming! And totally agree on the smell of coffee! My mom said just this weekend that she is in her 60s and still hates the taste of all things coffee, but she loves the smell! good for you Kath! I love these posts! i do love tea, and if I have a couple classes to teach on a particularly tired morning, i run to starbucks for a big ol iced tea. That caffeine is sure a shot of energy! I guess once in a while is fun. I like how your wine and coffee with be extra special now! The alcohol thing often weighs on my mind. I love a few glasses of wine at the end of the day to relax and put my mind into “evening mode” and I just love the taste! And I love a few beers with my boyfriend or friends on weekends for the same reasons. But I do sometimes feel guilty or like I should “take nights off” when I don’t often feel any ill effects. I think it’s interesting that it carries a moral weight sometimes. Thought this was interesting: https://www.nytimes.com/2017/03/13/well/do-we-need-to-give-up-alcohol-to-lose-weight-not-necessarily.html. That’s a really interesting article. I actually feel like alcohol doesn’t really affect my weight or maybe I’m even at a lower weight when I have a drink most days (a drink, not 5 like they said in the article). It has puzzled me for a while! I wonder if having a glass of wine satisfies some box that otherwise would have me reaching for dessert or emotional eating of some kind….hmmm…. I’m *totally* guilty of the “well I’m not drinking any wine tonight so I definitely need chocolate” mindset. I love my coffee and have only really given it up during pregnancy (and only at the beginning, a little crept back in when the babies were baked a little). I do not think I have a “problem” with alcohol, but I have definitely felt myself turning to it for the wrong reasons lately. Not to be political, but the election really threw me for a loop both personally and professionally. I feel like I was drowning my sorrows for most of November and now my work is so stressful (not to mention managing my household of 4 kids and a dog) that I was finding myself “needing” at least a glass of wine every day. The reality is that my glass of wine is definitely not the recommended 4-5 ounces, so if you add up a large glass a day with the occasional 2 on the weekends, I was drinking closer to 10-12 drinks a week. Not OK! So I gave up alcohol for lent, and so far so good. I’m sure I will go back to drinking after Easter, but I think this is a good reset for me so that I can set better boundaries. I’m wondering – is a sugary mocktail (and I feel like most of them are…if there’s a non-sugar mocktail, post the recipe!!) really ‘better’ than drinking a glass of wine as a treat? Mine aren’t really sugary – kombucha is fairly low, but most often I do seltzer with lemon or lime – calorie and sugar free. I buy a good bottle of wine on Friday, and I try to savor that and have usually one glass (or two…) at night with dinner. When that bottle is gone, I take a day or two, or several:) days off, until Friday rolls around again. If I kept full stock in my home, I’d probably drink every night. And with coffee, I drink it everyday:) 1-2 cups and I love it! That’s very similar to what I do, but I often open the bottle on Saturday night and then I’m drinking on Sunday + Monday to use it up! I’m surprised by how many commenters above aren’t drinkers. I love alcohol. Wine, beer, cocktails. I usually have 1-2 drinks at least 3-4 times a week. As do I! My husband and I have really cut back on the weeknight drinking but we indulge with friends on the weekends way over the recommended limit! Glad I wasn’t the only one feeling like a boozer. However, if I had to choose between giving up wine or giving up coffee??? I would give up wine. I am a total coffee addict. I’ve been trying to lower my intake because I definitely have been substituting coffee for sleep. My job requires early morning hours and I totally know what you mean about feeling foggy. Not a great morning feeling! I definitely find myself drinking out of habit and have been thinking about it more recently than ever in the past! There’s part of having a glass of wine or a cocktails that definitively delineates “okay, the working part of the day is over.” It’s almost more symbolic than the actual physical effects, and though I LOVE sparkling water, it is not the same. On the other hand, it definitely messes with my sleep and makes me a little lazy in the evenings in a way I don’t really like. I have an 11 month old and swear having a cocktail every day when I got home from work is what kept me sane as I went back to working out of the home–a little “I survived another day” celebration. But now that the ship is righting again, I find myself weighing if this is something I want to continue or not? Or if I want to cut back, how much do I want to cut back? I don’t think I’m interested in becoming a weekend-only drinker, and a big part of me (the part that hates rules) isn’t drawn to the idea of having a set aside weekday where alcohol is allowed (feels like the diet mentality where I’d have it that day even if I didn’t even want it because that was the day it was allowed). I’m so glad you brought this topic up. It’s difficult to weigh which is more important–feeling good physically by not drinking at all or feeling emotional pleasure/satisfaction from having a drink on a somewhat regular basis? And is it a problem to get so much pleasure from a drink or is that just our Puritan roots biasing us against alcohol? Nodding my head yes throughout all of this re. cutting it out and the diet mentality but also wanting to drink less. I think we have to go with what feels right. Is it a boring monday where we drank that weekend, or is it a celebratory Wednesday when it’s been a few days since our last drink. I, too was feeling the drag from coffee. In the afternoons I would come home and make a nice latte (hot or cold depending on season) and then I would get a headache and sometimes a stomach ache because I didn’t eat a real meal. I started drinking tea from the local grocery store, then I ventured into loose leaf from the store, then Teavana. Then I found Steeped Tea and boy did I learn about how loose leaf is so much better–like the local roasted coffee you spoke of. I drink tea all day long and do not experience the “gotta have my coffee” in the morning or the headaches at night. Steeped Tea is an MLM, but I find that I can just buy what I want for myself and not do sales, if I don’t want to. However, I do love their tea, so I love to share it. I would love to send you a sample. [email protected] No pressure, but maybe you will switch to tea. I grew up in a home where my parents did not drink alcohol or coffee. When I tried wine or coffee, it did not taste good to me so I never had a desire to drink it. I was a court reporter who worked in the county courthouse and reported the circuit criminal trials. It was one of the saddest things to see someone on trial for DUI with a fatality or bodily injury. So very sad for the victims, their families and also the defendant. It is never the intent for someone to hurt someone else when they drink and drive. If you had to sit through seeing this in the courtroom, it would probably make people think twice about drinking and driving of any kind. And I have to add just drinking around children makes them think it’s okay. I feel like a lot of people take that first drink as children from watching their parents. That definitely is what I hear about coffee drinkers. They started drinking it because their grandmother or mother drank it. I looooooove coffee, but almost always drink half caf because I’m pretty sensitive to caffeine as well. I actually really love plain old Kirkland Signature house blend from Costco, haha! Interestingly, I am pregnant with my 2nd baby and had to add caffeine back in after cutting down to just decaf early on because my blood pressure has gotten so low that i need to have my mug of half caf each morning to keep from feeling like I’m going to pass out! My OB actually recommended it after I had a fainting episode! Alcohol is much easier for me, as I hardly ever have the urge to drink at home. I like to have wine or a fun cocktail when I go out to dinner, though! And I have been joking with my husband that I am going to make him bring me a margarita in the hospital when this baby is born because I’ve been craving them like crazy! I think it is a very interesting topic, and you make good points that are specific to your situation. I unfortunately feel that the post reads a little bit like a justification for “controlling” your eating habits, and this starts to cross into disordered eating territory for me… this feeling is further reinforced for me when I read the comments… several readers used the wording “being good” when talking about limiting the intake of coffee or wine, vs. being “bad” when they indulge… I feel that you may be triggering some negative thoughts regarding eating with your post, which is not your intention, I am sure! I feel that in our culture coffee and alcohol become equated with ” legal drug” and I feel that it is unfair comparison. Why “limiting” behavior? I feel that if there is no limit, your intuitive eating should be able to tell you when you have enjoyed enough, and from what I see from your posts, it usually does… Also, I listened to Brook Castillo’s podcast (re: love) and I did not find anywhere any information on how is Brook qualified to provide counseling or psychological help: her only credentials listed are “master life coach”. I feel that her advice is not rooted in research or solid scientific foundation, and sounds like pseudo science, unfortunately. If I am mistaken regarding Ms. Castillo’s credentials, please correct me! I feel that listening to her “advice” is not necessarily beneficial, as I have no assurances that she knows what she is talking about. I am surprised that you, Kath who IS imminently qualified to discuss nutrition, would recommend someone seemingly without any background in psychology, counseling or psychiatry. Well I’m not recommending anyone see her in a clinical sense – just that they listen to her good advice and ponder it. So shocked how many people don’t drink. My kids are 6.5 and 7. The first 4-5 years with them I barely drank more than 1 glass of wine a serving because I just couldn’t deal with feeling hungover and screaming kids. Ha! But once they started to get older, I definitely added it back in. I love wine, having a glass and conversation with my husband, and enjoying it with food. Some nights nothing, others 1 glass, and then other nights quite a few glasses. I’m pregnant now and about to deliver so I’m interested to see where my interest will be after baby arrives and the next couple years. Giving it up while pregnant was not an issue for me. Like everything, my patterns change depending on my stage of life. Coffee is something I consistently drink 1 cup of a day. I swear I feel better and more awake in the morning upon my first sip of coffee. I have four cups in a row, then I’m done until the next morning. When I have to fast before lab work, I swear it almost kills me. My heart races and my palms get sweaty now just thinking about it. I have no desire whatsoever for wine, I’ve never liked the taste of it. I don’t drink anything anymore but used to drink a lot of beer. Do you follow the podcast The Health Nut and the Hot Mess? 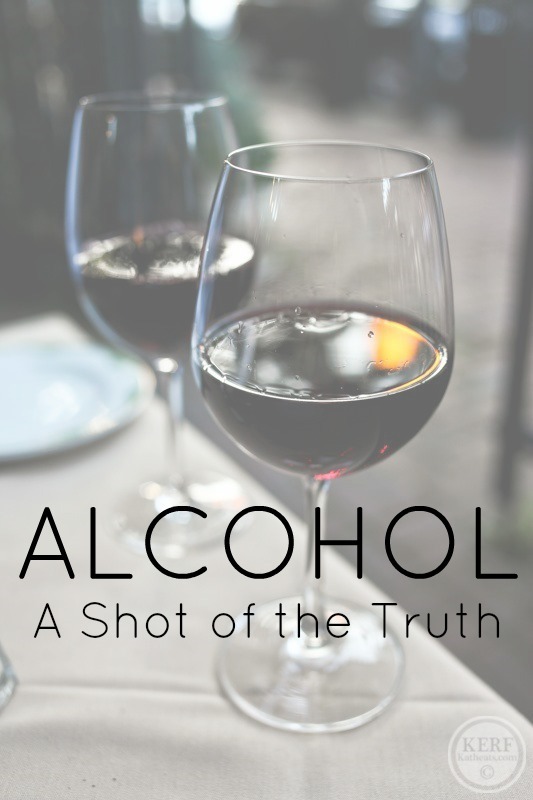 They cover the alcohol topic in Avery interesting podcast (I think it’s #1) in their series. Such a timely discussion as alcohol seems to become more and more prevalent in our daily lives. I drink a cup of coffee (8 oz or less) every morning and a glass of wine every night with dinner. Enjoy both and don’t think I’ll be giving up either unless there’s good data showing that its harmful. If you feel great, then keep doin’ what you’re doin’! I used to consume a bottle of wine a week, and then I found out I have cysts on my kidneys. Although these are benign and common, I just figured “Why push it?” And I decided to cut out alcohol. At first it was HARD because wine is so relaxing! And it is so socially acceptable for women/moms to end their days with wine – we joke about that all the time! I felt like I deserved it and almost needed it to feel sufficiently decompressed. Nowadays I still put the kids to bed, pull on comfy clothes, and grab the special glass, but I’m filling it with cranberry juice instead. It gives me something to sip mindfully and savor. It gives me something to relax into. It gives me something to hold while I watch my shows. I get all the benefits of the ritual without the drawbacks (and since it is unsweetened cranberry juice I get some benefit too!) I truly do not miss alcohol anymore and I know my body is happier too. Best Wishes! Totally agree about the special time. What brand is the unsweetened cranberry juice? I’d love to try that. I’m currently pregnant but typically a ‘glass of wine a night’ person when I’m not. I’ve been doing unsweetened cranberry juice too (in a red wine glass, fancy!). I buy the trader joe’s brand. Super tart, but so good. R.W. Knudsen is the brand I drink. They also have a tart cherry juice that is very good too – full of antioxidants! Cut it with seltzer for a little whimsy! This is an interesting post. I am an alcoholic so I don’t drink and have been in recovery for 3 years. The thing is, for a non-alcoholic, moderation is possible. Not the case for me! When you don’t drink, you really start to notice how pervasive alcohol is and how it can be very socially unacceptable to not drink. I don’t identify as an alcoholic until I know someone really well so I often have people pushing me to drink when I do go out to social events. You also notice that a lot of people, who are not alcoholic, choose to never drink. I guess it depends on the crowd and situation. My perspective is entirely different than most, for obvious reasons, but there is certainly a freedom in not drinking and to realizing that it is a mind altering substance that has been incredibly normalized in our society. I have never liked the smell of coffee, so never started drinking it. I start my day with either a run or a strength workout at 5:30am, so that is definitely my morning “pick me up”. As for alcohol, I’m very lucky in that it’s not something I crave or usually even want. I like an occasional margarita on a hot summer afternoon get-together, but that’s about it. In my line of work (therapy), I have seen a lot of damage that alcohol has done to people’s lives, and it just kind of turned me off to alcohol in general over the years. With the possible link between alcohol and breast cancer, I was never an alcohol drinker. I have a strong family history of breast cancer in my family. I love coffee and used to drink one cup a day. A few years ago I was suddenly so sensitive to caffeine that I can’t have half a cup at 5am unless I want to be up for 22 hours. Weird. I found some water processed beans on Amazon that are good, but decaf just isn’t the same.